We forget, engaged as we are in a modern world of television broadcasts and palm-held technology, but anime had very humble roots. It drew on many different methods of conveying narrative and character to audiences, building upon a rich visual and aural tradition that Japan has possessed for thousands of years. And as with any method of culture or medium, those humble roots grew into something entirely new and fascinating. One of the “unsung” ancestors of modern Japanese animation was the kamishibai. A style of “art,” “theatre” and storytelling with a long history, kamishibai, or "paper box theatre," was quite popular in Japan from the late 1920-1950s. Storytellers on bicycles would crisscross the countryside, bring tales of wonder, suspense, (and the occasional bit of fear), to children and adults alike. Wielding their lanterns and prints as a samurai his blade, the traveling wordsmiths were often anticipated by villages along their route, as the kamishibai was frequently a mode of entertainment the entire community could get behind (despite being designed almost explicitly for children). Despite origins frequently attributed to 1920s Japan, the roots of kamishibai can be traced as far back as the 9th-12th century (depending on who you talk to). The common consensus between each of the ‘origin stories’ is that kamishibai were, at least initially, used to tell “morality plays” pertaining to the buddhist influence and practice thereof. By utilizing a concept known as emakimono (whereby elaborately illustrated paper screens were rolled across a presentation “stage” to tell a complete story), “professional” storytellers (often monks) would instruct their audiences though parable, metaphor, and tales designed to evoke either philosophy, or impart lessons of wisdom. These presentations were often effective (not to mention important) methods through which buddhist teachings were explained to the widely illiterate and ‘unenlightened’ folk unfamiliar with them, and were designed to be appealing to both children and adults. Around the time of the Edo period, specialized storytellers called etoki would adapt this style of “simple theatre” towards more secular works and tales (though the sacred-style roots would never disappear). The etoki were themselves performers, who practiced their craft professionally through acting, research, dynamic storytelling, and occasional designing of the emaki themselves. By creating portable stages, some of these same etoki were able to take their shows “on the road,” traveling between cities and villages, and performing for wider audiences. As history plodded forward towards the Meiji, this method of “street theatre” would become very popular, coinciding with the rise of new consumer art forms such as ukiyo-e (wood block prints, which themselves were contemporary with the emaki the etoki utilized), performance art like kabuki and noh (which were influential to both elite and commoner alike, and heralded for their foci on folklore and moral discourse), and the influx of more western stories and technology. 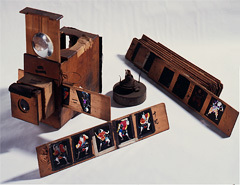 At about the same time, a new form of “art theatre” was also beginning to blossom in Japan- utsushi-e. Also known as nishiki-kage-e (Brocade Shadow Picture), utsushi-e utilized the “magic lantern,” which had been imported from Holland to Nagasaki during the Edo period. By placing illustrated slides in front of glowing lantern beams, images could be projected on walls, ceilings, or even other people. These lantern shows would prove to be as popular- if not more so- than the “live action” stories told by the etoki, since they mixed “exotic” foreign technology with local stories, and relied heavily on color, music and developing an atmosphere through which the stories were experienced. 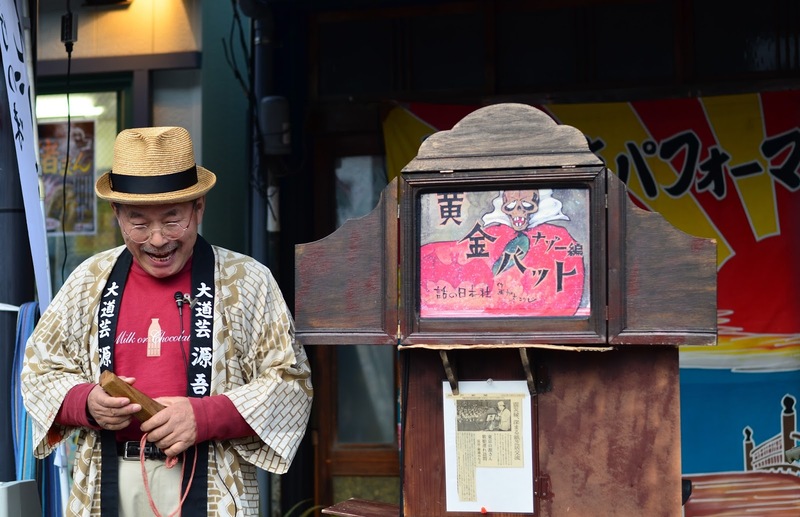 As with kamishibai, utsushi-e artists would travel between districts, showcasing stories and impressing audiences. Where the kamishibai etoki drew on dynamic tales and enthusiastic ‘actors,’ utsushi-e employed musicians and artists to bring their tales to life, creating worlds that both enticed the viewer and stirred the emotions (usually wonder, occasionally fear, rarely disdain). Residing as they did in different spheres, the two art form nonetheless represented a changing Japan, highlighting the ways technology could be employed for the common people, and emphasizing progress without the sacrifice of what made Japan culturally unique. Of course, both these methods of theatre would rely heavily on folk tales and those narratives with “phantasmagoric” qualities, like ghost stories and legends. Yuurei, youkai and all manner of kami would come alive, either through the etoki’s words and gestures, or through the “magic” of light, limited-form “animation” and live music. 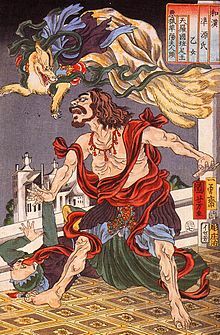 Anyone familiar with Japanese folklore and history is already aware of the power with which the spirit world affected both the physical and spiritual worlds, and how these creatures often thrived on mystery, ambiguity and the power of the unseen. So it is of little surprise that these tales were also among the most popular, be it for youth or adults. After all, we do like being scared, right? For a moment, try to imagine yourself, as a child maybe, sitting in a darkened room, watching as the tanuki and kitsune your grandmother ‘warned’ you about came alive, moving and cavorting about on ‘screen.’ Maybe there is some mist in the air, casting a glow over the lantern and making the images appear hazy. You try to listen for those plucked notes, hearing the sharpness of a stringed instrument split the air, and shiver as the “monsters” move and change color with each loud clap of the frame. Imagine hearing a storyteller weave a fable about when the ghosts come calling on nights of the full moon, changing his pitch and meter as the white spectre inches ever so close to you, hearing the scraping of the emaki as it changes from one scene to the other. Can you feel the chills down your spine? Do you respect this new medium? Will you listen the next time your elders tell you not to go outside after dark? While utsushi-e would fall victim to the rise of cinema, which supplanted the “magic lantern” acround the world, kamishibai would survive well into the 1950s in Japan, owing mostly to economics and the war itself. Rampant unemployment would often lead able-bodied men to take up the role of etoki, not as professional performers per se, but as traveling merchants who would sell candies and treats to children, then “set up shop” to tell them stories. It was a means of making an income during those dark days, and another method through which the Japanese could continue their traditions and way of life, without giving too much ground to the "gaijin." Thanks to craftsmanship and ingenuity, now the formerly large “paper stages” could fit onto the backs of bicycles, which the new etoki would ride from town to town, just like their Edo period ‘ancestors.’ Utilizing hyoshigi, or wooden clappers (which figures nicely into one of the legendary Seven Wonders of Honjo- imagine a ghost etoki luring people out after dark. THAT would make for a splendid kamishibai tale) to announce their arrival, they would wait for the children to come. Over the course of each visit (usually a few days, on a cyclical rotation,) they would present each narrative as part of a serial, with subsequent chapters occurring in order. Each chapter itself would contain between 8 and 10 “frames,” usually ending with a “cliffhanger” (not unlike modern television serials), and would be followed by one or two different stories, meant to appeal to a wide audience. Also as with serials, each story would run about 30 “episodes,” at which point it would be retired. This gave the new etoki reason to return to each town again and again, and also allowed them to cultivate personal relationships with townsfolk, while improving their skills at storytelling and performance art.